April Meservy wasn’t the only LDS musician that was featured at this year’s Olympic Games. Vincent Zhou, the youngest figure skater, performed to the cover “Chasing Cars” arranged by Rob Garner. Rob told the Deseret News, “It’s cool to be able to be a part of that in a small way, that the music we did inspired him to do the routine at least to some extent.” Zhou is a 17-year-old figure skater. He landed the first-ever quadruple lutz and placed 6th overall. Russian figure skater and third-time veteran, Ekaterina Bobrova and Dmitri Soloviev skated to The Piano Guys’ One Republic and Beethoven mashup ” Beethoven’s 5 Secrets.” They placed third in the Ice Dance Free Category and gained the silver medal. 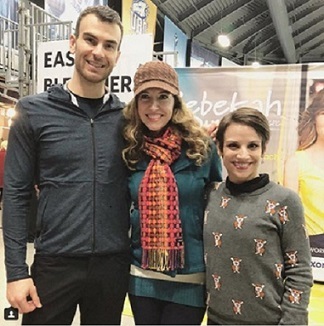 The couple Meagan Duhamel and Eric Radford, who performed to April Meservy’s cover for “With or Without You” by U2 received the gold medal for their performance. April was able to fly out and see the couple perform to her song.